Protuberant ears can be a devastating aesthetic deformity. 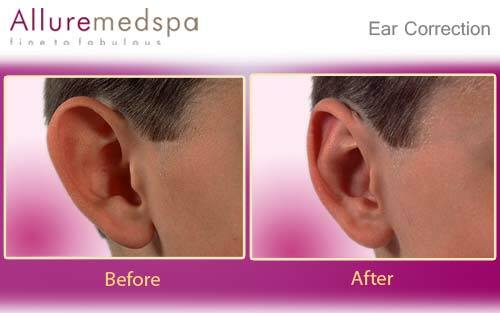 Otoplasty is a simple straight forward procedure, which can give the ears a natural shape, orientation and configuration, and have dramatic positive effects on one's self esteem. There are two principal conditions that require Otoplasty for cosmetic reasons. These may exist in isolation or in combination. 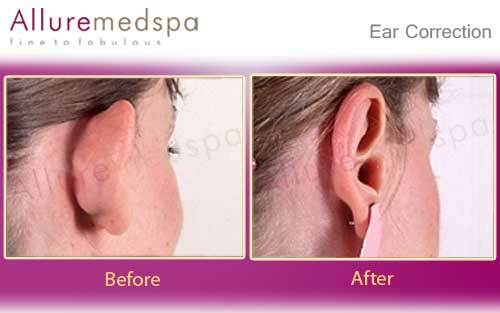 A "lop-ear deformity" refers to the absence of an ear-cartilage fold known as the antihelix, which is the smaller curved inner ridge of the ear that parallels the outer curve of the ear. 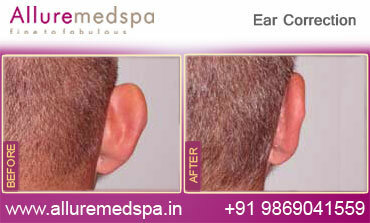 This type of deformity presents as an abnormally shaped ear that tends to flop forward. The second common condition is a "cup-ear deformity," which refers to the exuberant cup-like cartilage bowl that resides near the actual ear canal that in turn makes the ear project out excessively. Surgery involves identifying the exact cosmetic problem and intervening in a targeted approach and on a timely basis. 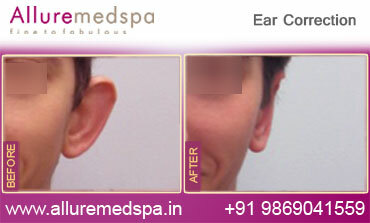 Otoplasty not only provides a cosmetic improvement, but also a psychological improvement as well. Otoplasty, or ear surgery, refers to the surgical correction of ears to pin them back, reduce them in size, correct a deformity, or make them more symmetrical. Otoplasty is commonly performed in an outpatient surgical facility and takes approximately 1-2 hours. 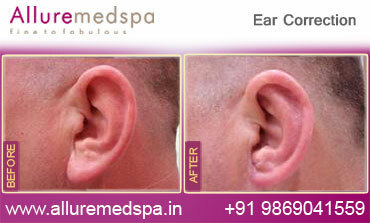 An incision is made just behind the ear, in the natural skin fold where the ear is joined to the head. Cartilage may be sculpted and bent back toward the head with non-removable sutures used to help maintain the new shape, or cartilage may be removed to create a natural-looking ear fold. 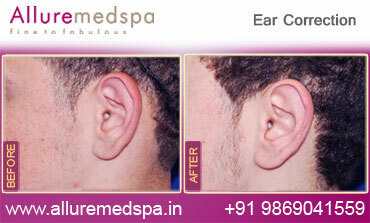 Incisions are usually made behind the ear or within the ear creases. Dressings and/or bandages will be applied to the ears post procedure for added support and protection. Your doctor will prescribe pain medication as needed. Bandages are typically removed after a few days of surgery. Dr. Milan Doshi at Allure MedSpa is a Board Certified Otolaryngologist, which means that he has advanced surgical training with ears, in addition to his specialty training in Facial cosmetic Surgery. Dr. Doshi has pioneered a technique that allows him to perform otoplasty as an in office procedure. Generally, in Otoplasty surgery, an extremely safe combination of iv sedation and local anesthetic, and not general anesthesia is used. This technique provides superior operating conditions combined with maximal patient safety and comfort. The recovery for Otoplasty is rather mild. The surgery is ambulatory, meaning that the patient is allowed to return home the same day of the surgery. The patient will then return to the office on the first post-operative day. Allure MedSpa which is renowned for its state-of-the-art internationally acclaimed services,offers value for the money with cosmetic procedures. To know more about the cost of your procedure request a consult by filling the form below. Your consultation is your chance to ask questions about Ear Correction and put your mind at rest. Your surgeon will be able to offer you full explanations and answers to all of your queries. Good candidates for otoplasty include individuals who are physically healthy, realistic in their expectations, and interested in improving the appearance of their protruding ears. Unnecessary pressure should be avoided, so it is recommended that patients wear loose fitting shirt collars and rest on their back. Headbands might be recommended to hold the ears in the desired position up to two weeks after the surgery. You should plan to take one to two weeks off of work, so swelling and bruising can resolve. 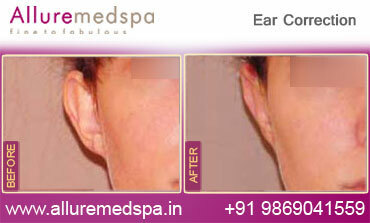 Otoplasty results are immediate and permanent. At Allure MedSpa, our support doesn’t end when you achieve your cosmetic and health goals. Lifelong follow-up with our multidisciplinary team is encouraged, helping you to achieve and maintain optimal results. For more information on hair transplant surgery and our extensive aftercare program or to Book an appointment, call Allure MedSpa at: 91 9869041559. Is it quite painful? Is there much bruising? It takes about a week for most of the swelling to subside, although the ear will be sensitive to pressure for about 2 weeks. Bruising is usually minimal, although some people are more prone to it than others. There is usually some pain postoperatively, but not a great deal, and it should be able to be controlled with prescribed pain relievers by your surgeon. The risks of the operation are bleeding and infection. Both are exceedingly rare. With proper postoperative care, this is a very safe and satisfying operation that carries very little risk, offers beautiful results, and almost no discomfort from the operation itself. 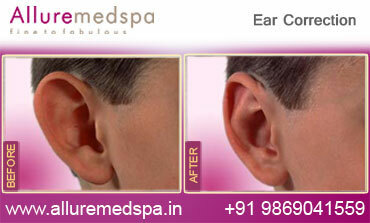 You should know that your ears may feel numb for 2 to 3 months after the operation. Sensation returns slowly over that time. This is the reason that there is generally no pain in the postoperative period. This also makes the operation exceptionally well tolerated in children.